In anticipation of Injustice: Gods Among Us coming out next month, let’s revisit the Flash’s video game appearances of choice: the Flash in fighting games. 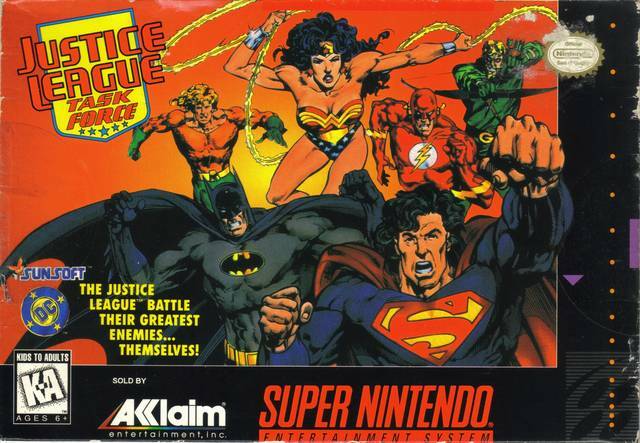 Today: Justice League Task Force (“JLTF”), basically Injustice on the SNES or Genesis from 1995. Pictured Above: What’s you favorite Blizzard game? Justice League Task Force? Mine too! Initial blanket criticism: The Flash doesn’t belong in fighting games. Unless he’s fighting another speedster or he’s massively depowered, no opponent should have a chance against him. A modest iteration of the Flash is a guy that punches really fast and dodges bullets. Anything above that, he’s a guy that steals the speed of the opponent, freezes time, and executes punches with infinite mass. As Agnes would put it, “He’ll kill you five times before you hit the ground.” Did you lose Round 1? Why not run backward in time for a redo? Blanket criticism aside, let’s turn to JLTF. As far as I can tell, both the SNES and Genesis version of JLTF are despised equally, even though they are slightly different from one another. It’s commonly ranked as one of the worst fighting games of all time and Cracked even has a standalone article about it. The major criticism of both iterations is just “Why would you play this and not a technically sound game like Street Fighter?” To that, I say, “Because you can play as the Justice League, stupid.” It’s easier to justify today though, as these games are just up for emulation or available at a garage sale for 50 cents, so there’s not much investment involved. Back in the day, if you forked over $60 for one of them, you’d probably be pretty mad at how they limited they are. The day you bought JLTF instead of Street Fighter II would probably haunt you the rest of your life. It’s not Shaq Fu-bad though, because nothing but Shaq Fu is as bad as Shaq Fu. It’s fun to say Shaq Fu. Pictured above: A Shoryuken, but totally not a Shoryuken. If you don’t want to track it down yourself for reference, here is a clip of the Flash beating up Darkseid on the SNES. To the Tatsumaki Senpuukyaku fluent out there, the Flash on the SNES probably looks like skinny E. Honda. The Genesis version is similar, but with a unique whirling dervish attack. Today, he’s probably more like Chun Li in drag (just let that thought soak in for a moment.) First, he’s got a version of the Hundred Hand Slap or the Hyakuretsu Kyaku from just mashing punch. For the long-range game, the Flash has a tornado projectile, like Chun Li’s Kikouken. Of most note is his teleport, like Dhalsim’s or M. Bison’s, but it’s got a sweet dash animation like he just moved so fast you couldn’t see it. Did he travel all the way around the world, or move so fast he disappeared out of existence, just to get to the other side of the screen? We don’t know. Pictured above: Adam West holding his own somehow. The Flash in JLTF just sounds really good on paper. The Cheetah character actually has more “speedstery” dash moves, but the Flash has more creative uses. He’s an aggressive, dashing, cornering, projectile shooting, teleporter, so good luck in the meta-game against him. His power concept really leaves him open to play like anything in a fighting game, and this is the most egregious example out there. So I give this appearance a thumbs-up, just because this Flash would probably draw imbalance complaints and nerf requests in the modern esports era. The problem is he’s just as sluggish as the other characters in his normal movement. Maybe he’s self-handicapping. In fact, all the characters in the game are “samey”: Batman shoots Batarangs, Green Arrow shoots arrows, Superman/Despero/Darkseid all have eye lasers, and Aquaman even shoots water. The nice thing about Street Fighter is most characters play differently, and something like Ryu’s fireball will throw differently from Dhalsim’s Yoga Fire, etc. In JLTF, there’s no such attention to detail, so you may get bored quickly. And the storyline is pretty bad. In the single player mode, you fight android doppelgangers of the Justice League one by one, in the end discovering it was all a Darkseid plot. If the game had more Legion of Doom members, it would make more sense and probably be more fun. I mean, if an android Superman, Batman, and Aquaman all attacked you sequentially, why would you continue to track down the Justice League and then be surprised when android Green Arrow and android Wonder Woman attack you as well? 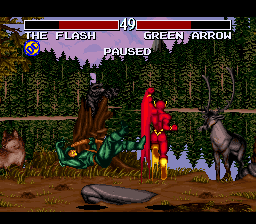 The Flash beating the tar out of a Green Arrow android would be fun to watch any day, what with catching arrows in midair, etc., but it’s just not the essence of what a Justice League game should be. 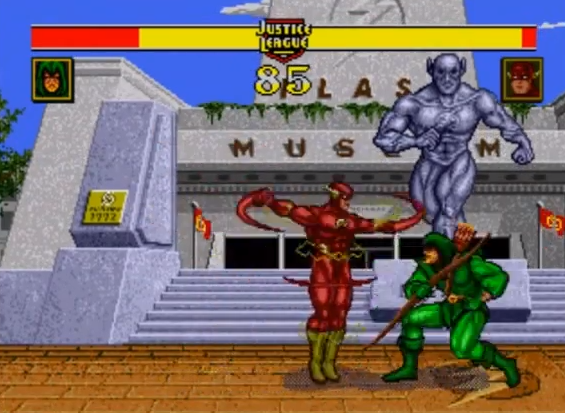 The Flash Museum stage on the Genesis is a nice touch. The Flash’s stage on SNES is horrible though. It’s a desert with no music. It may just be 16-bit nostalgia talking, but why does Batman get a sweet Castlevania-type theme and the Flash gets nothing? And where is a palette-swap of the Flash as the Reverse Flash? Where’s a yellow version of his same sprite, with more “sinister” moves? Why not artificially increase the number of playable characters with a Bizzaro Superman or Reverse Flash? Missed opportunity if ever there was one. Bottom line: the game is a nice novelty. You may enjoy playing through the single player mode in one sitting, and you might enjoy playing against a friend to discover just how ‘not Street Fighter’ the game is. If we want to get serious about this game though, we’re definitely going to have to pitch in together on a cash prize for a worldwide JLTF championship. I’m sure Blizzard will be interested in sponsoring and livestreaming it. It’s not like they have anything interesting going for them right now. Previous articles in this series include Part 1: 90s Handhelds and Part 2: Earth’s Final Defense. This entry was posted in Media and tagged Games, Guest Posts, Justice League Task Force, Sega Genesis, Super Nintendo, Video Games on March 11, 2013 by Guest Blogger. I was always frustrated, though, that this game included Despero and Green Arrow, but not Green Lantern or a Batman villain. I know, right? Throw in a Sinestro palette swap of GL on top of that, and you’ve got a Mortal Kombat calibre game. I remember liking the music, and the fact that Wally was badly overpowered. I agree. On the SNES, the Superman and Wonder Woman themes get you pretty pumped, the character select is neat, and the musical sting when a match ends is pretty bad to the bone. It’s almost an instance where the sound design overpowers the games shortfalls. I LOVE this game! Granted, it’s been a decade at least since I’ve played it, but my siblings and I loved playing it back in the day! For the time, I thought the graphics, especially the Flash’s speed blur, were great! Nice game series of posts. I think the most disturbing thing about this game, after watching the “Flash vs. Darkseid” clip, is that it features “mullet Superman” along with “mullet Aquaman.” And that Wonder Woman’s hair moves constantly like Medusa snakes, while Aquaman and Superman’s hair stays put. Strange.